Many areas will witness high temperatures. Will the heat action plans work? India’s "killer" heat waves are back and have already claimed 130 lives this season, according to news reports. At least 30 have perished in Odisha and more than 100 have died in other states. With the onset of summer, maximum temperatures have started increasing. Unlike March-April 2015, people aren’t getting much relief from high temperatures due to the absence of thunderstorms and rain. Temperatures in some areas have crossed 45°C. They have been consistently above normal in many areas of West Bengal, Odisha, Bihar, Jharkhand, Uttar Pradesh, Maharashtra, Telangana and Andhra Pradesh. 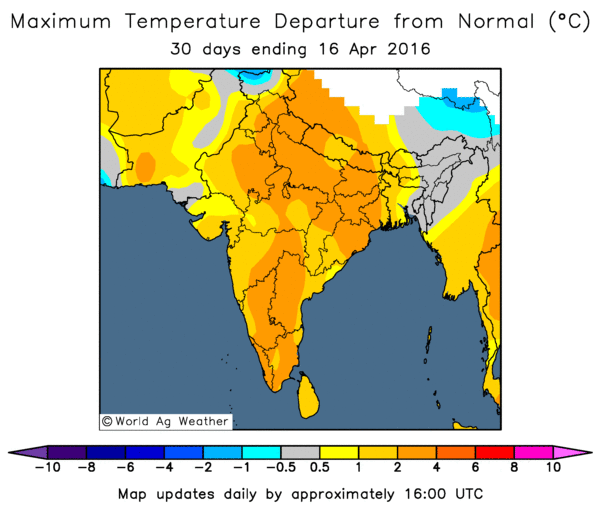 Between mid-March and mid-April 2016, maximum temperatures (excluding northeastern states and Jammu and Kashmir) have been above normal by 2-4°C. The greatest impact of this has been in north-central and eastern India. We often think that high temperatures and hot winds mean heat waves but that’s not so. Countries like the United States, the Netherlands, Denmark and England have their own definitions of a heat wave. India Meteorological Department (IMD) has also created proper definitions for heat waves in plains, hilly and coastal areas. For heat waves to be declared, the maximum temperature at a place in the plains or in the hilly regions must reach at least 40°C or 30°C respectively. If this happens and deviation of maximum temperature of that place from normal maximum temperature becomes 4.5°C to 6.4°C, then a heat wave is declared. If this departure becomes 6.5°C or above, then a severe heat wave is declared. Alternatively, a heat wave is declared if the maximum temperature equals 45°C or above and a severe heat wave is declared if the maximum temperature equals 47°C or above. For coastal areas, maximum temperatures need to be at least 37°C or above and their departure from normal must be above 4.5°C. Heat waves are India’s regular "visitors" but they have caught everyone’s attention in recent years due to their links with climate change. For heat waves to form, the weather in a region needs to be mostly clear. All you need is an inflow of dry and hot near surface winds for temperatures to rise. Often there is a stagnant high pressure in the atmosphere which causes such heat waves. Cloud cover (mainly dense cloud cover), thunderstorms/rain reduce the heating of the surface due to which temperatures don’t soar too high and heat waves don’t form. Such dry winds bring heat waves in coastal areas when the land-sea breeze weakens. At present, dry and hot near surface winds are blowing over the northern half of India (areas above the Tropic of Cancer) from west/northwest direction. As a result of this, many areas are witnessing dry and hot weather. Over the years, there has been a lot of research on heat waves and their connections with El Niño Southern Oscillation and global warming. Recently, J Ratnam and other scientists from JAMSTEC Japan, and M Rajeevan, secretary of Ministry of Earth Sciences, investigated the causes of Indian heat waves and published a paper titled "Anatomy of Indian heat waves". Using observational data for the period from March-June from 1982-2013 and statistical methods, they identified two types of heat waves in India—one over north-central India and second over coastal eastern India. They stated that heat waves in north and central India are associated with atmospheric blocking over the Atlantic Ocean. Heat waves in coastal eastern India are associated with the reduction of moisture (thunderstorms) in these areas. Winds from the west/northwest drive the moisture away and this also reduces the land-sea breeze, thereby increasing the temperature. There won’t be any significant respite this week from the ongoing heat in many areas of India. Maximum temperatures are expected to increase by a couple of degrees in the eastern and central parts of India (yellow dotted circle areas in image 1). 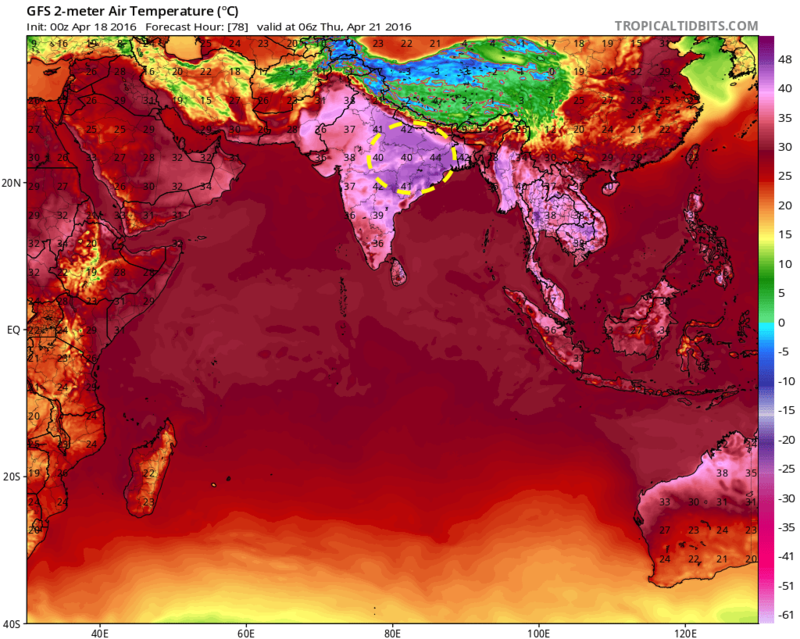 As a result, significantly high temperatures (mostly in the 41-46°C range) are anticipated in many areas of West Bengal, Odisha, Bihar, Jharkhand, Vidarbha (of Maharashtra) and Uttar Pradesh. It appears that the effect of these rising temperatures will be the highest in West Bengal as compared to the other states of India. Once again, heat waves to severe heat waves will be witnessed in the aforementioned states. The plains of North India too will witness hot weather this week. In India, more than 3,000 people were killed during the heat wave of 2003, whereas more than 2,000 people lost their lives during the 1998 heat wave. At least 1,300 deaths were reported during the heat wave of 1988, whereas more than 2,000 people were killed during the heat wave in 2015. All these years were either El Niño years or the years following an El Niño event. Until 2015, techniques of forecasting and detecting heat waves weren’t up to the mark. Also, there wasn’t any proper coordination between the weather department, state governments, municipal corporations and hospitals. As a result, proper plans for dealing with heat waves weren’t devised. Having recognised this gap, IMD issued the first-of-its-kind seasonal outlook for the summer. They have also started issuing extended range forecast of heat waves using advanced climate prediction system developed at Indian Institute of Tropical Meteorology, Pune. Heat action plans have been implemented in Ahmedabad, Nagpur and Bhubaneswar. But will these measures succeed in keeping the mortality rate low? The good thing about such heat action plans is that they increase the coordination between government agencies and the weather department which leaves the hospitals and administration better prepared to handle heat-related illness. But the measures suggested by these plans aren’t that viable (in the context of India) and they don’t address other local issues which are very important. The best way of avoiding heat strokes is to stay indoors (properly ventilated and cooled spaces), wear light clothes and keep oneself hydrated. But can the working class and poor people manage to follow this advisory? A large percentage of India’s population still survives on daily wages. In drought-hit areas such as Vidarbha and Marathwada, MGNREGA is the main source of income. If these people don’t go out to work, their survival will become difficult. Even the odd-even scheme in Delhi requires a large number of volunteers to stand in the sun for long hours. Heat-related illness can also occur by staying indoors. Every city has houses and slums which have poor or no ventilation, causing death due to high temperatures and suffocation. Young children and senior citizens are especially vulnerable. These action plans don’t emphasise developing paramedical services but only promote some dos and don'ts. Thus, the western world model, though good, can’t work as efficiently in India. There is a strong need to develop indigenous heat action plans to address the problem. I myself published a paper "A method of forecasting the weather associated with western disturbances" in Indian J. Met. Hydrol. Geophys. , 29:515-520. In this paper classified the lower tropospheric wind patterns associated with western disturbances in to few types and associated a particular sequence of weather with each type. These are used to explain the winter precipitation and cold wave conditions -- similarly to heat wave conditions. The patterns simply explain how the cold/heat wave condition move with different patterns. This is mainly associated with the high pressurebelt around Nagapur and its movement [north to south and west to east]. This is a forecasting method as these are isolated events. If the system moves to west, the wind blows towards south, that is what the above temperature departure map shows.